The deadline for the reconstruction of the US$12m Apapa road project in Lagos state, Nigeria is now July 2018. There have been delays on the project due to logistical constraints and also heavy presence of underground utilities. This information is from the the Director of Project, AG Dangote Construction Company Limited; Mr. Olatunbosun Kalejaiye. He said the government have bring into service more pavers to make up for lost time on the project. At the beginning of the project there were discoveries of a lot of underground utilities including gas pipelines. It took about 93 days to find a way around it. This is approximately three (3) weeks delay time on the project twelve (12) months calendar. Also there were challenges of raining season, security, potholes on Wharf Road, Traffic issues, logistics and supplies among others. The Director also added that the focus is to deliver good and quality work. According to the pavement design the minimum for durability will be over 40 years. But still regular maintenance will must be carried out. There is also commitment from every stakeholder in ensuring the construction of the road. There is restriction on both lanes of the project except for site activities. Also other road users are using alternative routes; because they believe when the work is complete, it will be beneficial to everyone. The alternative routes include the Point Road, Liver Pool Road and some part of commercial avenue. Currently, all out-bounds from section 1-4 are complete. Also the road is about 75% complete while the remaining 25% will be complete by the end of July, 2018. 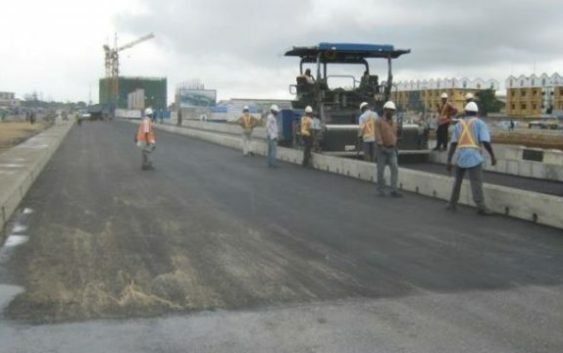 Due to the huge amount of money spent on road construction, Dangote Group president, Aliko Dangote is campaigning for the use of concrete for road construction in Nigeria. He said the resources currently used for road construction can be channeled towards other more important needs of the nation.